Romero Regales will make his debut in the Jupiler Pro League in the season 2015-16 after signing for Oud-Heverlee Leuven on a two-year deal. 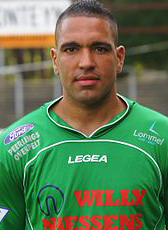 Regales was top scorer of the second tier in Belgium scoring 20 goals for Lommel United in the season 2014-15. Regales moved back to The Netherlands and signed a one-year contract at FC Den Bosch. In summer 2017 his contract has expired. In September 2018 he managed to find himself a new club and signed for the 2018-19 season of second tier Belgium club Lommel SK.